RUSH: All right. Let’s hit audio sound bite No. 3. This was yesterday at the White House business session with the governors, and Trump is talking about sheriff deputies who waited outside the Marjory Stoneman Douglas High School during the shooting on February 14th. THE PRESIDENT: You know, I really believe… You don’t know until you test it, but I think — I really believe I’d run into, even if I didn’t have a weapon and I think most of the people in this room would have done that, too, because I know most of you. But the way they performed was really a disgrace. So the Drive-Bys are making fun of it. Jake Tapper and some others on CNN. JAKE TAPPER: (music) President Trump says he would have rushed in to stop the Florida gunman even if he weren’t armed. His military academy classmates who served in Vietnam could not be reached for comment. JEFFREY TOOBIN: In fairness when you look at his heroism during the Vietnam War, a prisoner of war for five years… Oh, no, that was John McCain. I’m sorry. It’s like… It’s ridiculous. I mean, it’s embarrassing. ANDERSON COOPER: He did claim that, unlike Broward County deputies, he would have rushed into Stoneman Douglas. A.B. STODDARD: I can’t even go there. (snickering) I mean none of us know what it would be like in that situation. BILL KRISTOL: A normal president wouldn’t make it about himself. RUSH: “A normal president wouldn’t make it about himself.” Right. Okay, so November 20, 1991. I was in New York when this happened. The New York Daily News ran a story “that showed Trump stopped a guy from beating another man with a club,” with a baseball bat. “Trump was riding around Manhattan in his limo with his girlfriend, and later wife, Marla Maples,” who is the mother of Tiffany Trump. 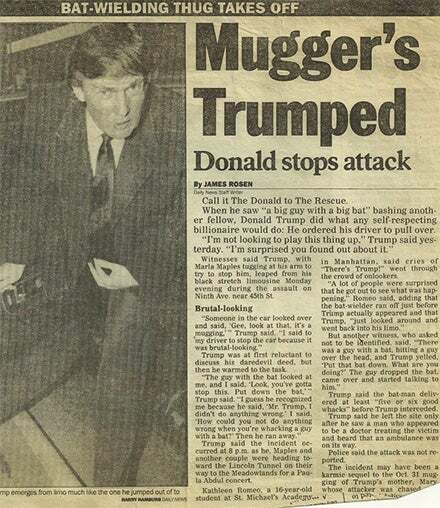 What this also shows, there was a crowd there, and nobody was doing anything to stop one guy whacking another guy with a bat until Trump shows up, gets out of the limo, goes over there and stops the beating. We actually have it. We’re gonna post it at RushLimbaugh.com. We went back and we got an actual photo of the New York Daily News page reporting this story. So the left wants to mock Trump all they can. They can’t help themselves. You heard Jeffrey Toobin in there, “In fairness, you look at Trump’s heroism in the Vietnam War, prisoner war for five years,” and Anderson Cooper and A.B. Stoddard and Bill Kristol and Jake Tapper. But there’s actual evidence that Trump did it on a previous occasion, even though it was back in 1991.